Overview- If Stafford can stay healthy and be the closer he should be, this is a SB caliber offense. We can run the ball more effectively with Moffitt taking over the weakest spot in the OL. Best has a breakout year and shows himself to be an every down back (minus obvious situations where you want a power back in). Overview- The best DL in the history of football. Easily a top 5 (at least) defense and definitely super bowl caliber. Our DB's are very solid and will thrive behind such a scary DL. We have options with Bailey potentially playing a bit of CB/S hybrid, the personnel options are endless. The LB's have solid depth and Irving could very well prove himself to be worthy of starting. With this defense, Detroit becomes one of the loudest, scariest stadiums to play at. That mixed with the fact we will have home field throughout puts us in the Super Bowl. That is a very interesting scenario. I THINK i like it. Personally, id rather if we were to trade our first round pick, it would be for Brian Cushing, considering a small odd chance he doesnt fit in with their new 3-4 D, but maybe a 1st round pick is too much. Whats your obsession with Doucet. His best season is sub 300 yards... Would love Greenway but why would the Vikings let him walk - not going to happen. Bailey isnt coming to Detroit to play safety. Corner yes but not safety. The Mario Williams part is a delusion. Would it be good, yes, but in no way resembles reality. The Haynesworth part is closer to reality but the skins got better offers than a 5th rd pick and didnt budge during the season. Someone will cough up a 3rd rounder for him. 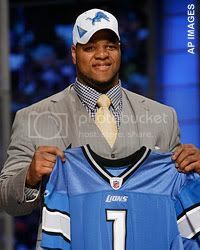 Also, you traded Sammie Lee Hill then still had him on the Lions DL without ever reaquiring him. I think Aaron Williams is a good pick but probably not there when we pick in Rd 2. I can live with Moffit. If you are worried about C, Wisniewski from Penn St could be had in Rd 2 and could play G initially then transition later to C. Kirkpatrick could be wise. Still not understanding why we would take Henry. Clay is a good pick in rd 7. Trade is plausible. Its a good end result but it would take heroic efforts to land Mario Williams, Haynesworth and Chad Greenway in one off season. I don't want anything to do with Haynesworth. I know he didn't like the system and how he was being treated in Washington, but don't act like a baby. When he got his chances to play he would just give up and stay on the ground. Not worth any kind of investment IMO. Put down the skunk weed and step away. Mario, Haynesworth, Greenway and Bailey??? Why stop there, go ahead and throw Namandi in there as well. i think mario williams will be on the market, i dont see him fitting 3-4 scheme. i really cant see mayhew giving up a first, third and sammie. who wants bailey and doucet. bailey is about to the end of his career, and doucet isnt ever gonna amount to much. if doucet was really, really cheap i guess he might be alright, but he isnt anything special. we dont need anybody flashy in the 3 spot, just a reciever with good hands that runs good, crisp routes(like a brandon stokely type). i could see haynesworth maybe finding his way to town and then i can also see him finding his way right back out of town the first time he acts up. i think he would be alright in detroit. he has a ton of respect for schwartz. schwartz and kvb might just be the guys to keep control of fat albert. i know i wouldnt want to piss off kvb, he seems to be kinda nutty and who knows what he might do to you. as far as stafford goes we dont have a clue how good he is, he looked good the couple times we seen him play this year, but i dont think he looked that good. i think he could progress into a great player, but i havent even seen him play 16 games yet so who knows. i could maybe see him getting us to the playoffs, but i doubt the superbowl next season. Thanks for catching that mistake, legend. It is more logical to get Williams than Cushing because Cushing can still play a LB spot... having Williams as a 3-4 DE is a waste of talent IMO. They are honestly better off getting a 1st and moving into the 3rd, while getting the nice young nose they need. Everything that happens is plausible... you guys act like since we did an overhaul that it's "impossible." Nobody's going to give up a 3rd for Haynesworth, and they are going to cut him, so it would be stupid for them not to get something out of it. Champ Bailey has said on many occasions he wants to move to safety. I believe Schwartz and Gunther use that to their advantage and change personnel according to the situation. Sometimes Bailey/Delmas/Spievay/Houston, sometimes Houston/Delmas/Bailey/Williams. It would give the defense some nice new looks. Imagine a Nickel D of Houston/Delmas/Bailey/Williams/Smith. Looks pretty hard to pass on, especially with the best DL in the history of football (according to my mock). I believe every move here is plausible. When the Texans are getting that kind of value for a player who most likely won't flourish in your system, they should take the deal. 3-4 linemen are meant to take up blockers. Mario flourishes as an outside rusher, not an inside rusher. He loses value on the Texans tremendously. It makes all the sense for Haynesworth to come to Detriot. The veteran leadership and coaching staff know how to keep him in check (from past experience). He would love to play next to Suh and KVB in his natural 4-3 all while being coached by Schwartz. The best part is, if he acts up, cut him and move on, no loss. It is a low risk/high reward move that could pay great dividends. There is no reason NOT to get him (unless you believe a 5th round pick is not worth the potential reward). I believe Doucet will be an asset in Detroit. He was not featured in Arizona at all (I know, you're going to say "there's a reason for that") but the dude has skills. I would not mind Breaston either, but I believe Doucet will flourish in what's an almost complete offense. Actually, im with you on Haynesworth. Now, common sense says to stay away from him. But look at the situation. Like many have said, most likely that wouldnt happen in Detroit. I think Haynesworth would love his situation in Detroit, playing next to Suh and KVB. Who wouldnt? If we could get him for a 5th, I think we would be dumb not to do it. If we get him in a trade, we get him with his current contract. Whilst the 'skins have covered his signing bonus and would have to eat that, we'd still be left with base salary and roster bonuses - which I understand are pretty huge. So we'd give up a 5th and a lot of $. For a player who is definitely a risk. I'd only be interested in trading for him if he is willing to change his deal to a more incentive laden one. Otherwise I'd see if he hits the FA market and take it from there. I'd also be wary of taking on a potential locker room problem to only potentially upgrade in an area where we are already strong. I have no interest in Haynesworth or Doucet. Haynesworth comes with a bag of attitude and far too big of a contract, and at this point I think Suh and Williams are better system fits. I don't see the need to get a starting DT, when our two starters are among the best in the business. I'd prefer to keep Hill. Mario Williams, I would love to get him, but no way the Texans trade him. Even in a 34, he's a dangerous guy. I'm sure Williams won't like the change, and may demand a trade. We'll see if he goes all "Haynesworth" in Houston because of the change in defensive scheme. Still, there will be a host of teams offering up all manner of picks and players for him. I don't think the Lions have enough ammunition to get him. Chad Greenway, there's no way he leaves Minnesota. Unless he just refuses to sign a contract, they don't let him leave without offering him a solid deal. He's one of their priority re-signings, just like David Harris is to the Jets. Early Doucet has never shown himself to be productive, so why all the love for him? I'd prefer to get someone who has shown he can be productive. I'd love to see us get a guy with unbelievable quickness....not pure speed, but quickness out of the breaks and that second gear down the field. Someone with reliable hands. As for the draft picks, Jake Kirkpatrick is the second rated OC in the draft, so he'll likely be long gone by the sixth round. I can see him going third round, at the latest. Wisniewski could be gone in the first round, like Maurkice Pouncey last year. Mike Pouncey will probably be gone in rounds two or three, strictly as a guard, which is his more natural position. Aaron Williams could be there in round two, since I think he's a so-so corner. Definitely not an immediate starter in the NFL, and may never become one. Nate Irving in round four is a dream as well, I think. But players sometimes fall, particularly linebackers, so that's a possibility. Also, why does your roster breakdown not include Cliff Avril. Are you expecting that the Lions won't resign him? In light of the Williams trade, yes. If the deal is right, I don't see why they wouldn't trade him. I very much doubt there will be a CBA before the draft, which means no player trades, only pick trades possible. And I wouldn't give up that much for Williams. With Suh and Williams/Hill, any DE is going to have a breakout season. If Avril demands too much, its his loss. With the uncertainty of the offseason and the inability to pick up free agents and even sign or tender our own free agents, I don't think we give up any picks unless we're stockpiling picks later in the draft. If the CBA doesn't get signed until September, we'll be screwed and trying to fill holes a week before the first game. You would be against trading a first for Mario Williams?! Mayhew should do that if the Texans agree to it. He is a top 3 DE in the league, and would give us the best DT, one of the best DE's and if we get Haynesworth, possible the 2nd best DT. KVB is no slouch either.